We started looking at property in October of 2014. We looked at acreages throughout Benton and Franklin Counties. A few places would’ve worked but nothing felt like home. 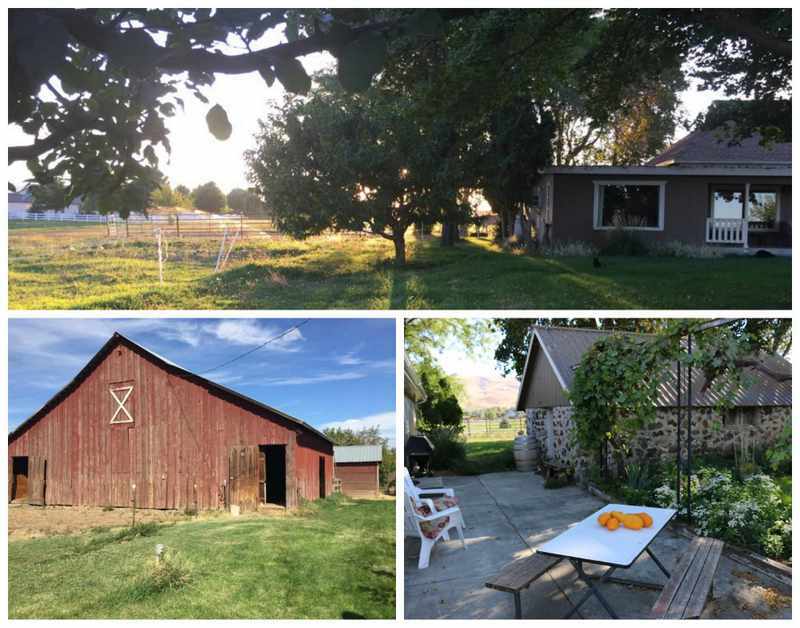 In the spring we nearly settled on a 5 acre place in Prosser, but lucky for us it sold too quickly to get our financing in order. We entered the summer blahs- too hot to work on outdoor projects, and acreages were selling too fast for us to even compete. We plucked along on indoor house projects, and I focused on paperwork for becoming a non-profit organization. By summer’s end I saw no end to the house projects and nothing inspiring to buy. I told Greg I was done looking and that we would spend the winter finishing up the house and start again next spring. It was the next day that I received a text from my friend Sharon wondering if I’d found a property for our farm sanctuary. “No”, I replied. “I’m done looking until spring. There isnothing out there.” She mentioned that her relative was selling a place in Prosser and it sounded perfect for us. She said it was a cottage like farmhouse, with an old barn, a stone building, and it was really cute with lots of land. “It has pastures with horses and sheep and a vineyard.” My curiosity was piqued. “How much?” She didn’t know but said the owner was really interested in my vegan farm sanctuary and wanted to talk to me. My heart started racing- was this the one? I called Leanna right away to inquire about the house. Everything sounded just too perfect. When LeeAnn answered she said, “I’m trying not to get too excited, but finally someone is speaking my language”. LeeAnn and I hit it off immediately. She told me all about the 10 acre 1908 homestead, the outbuildings, the 3 acres of Riesling grapes, the fruit trees and pastures, and her passion for animal rescue- especially horses and cats- how she wanted to sell, but it was important she sell to just the right person. I told her our dream of a farm animal sanctuary, events and retreats and selling vegetables, fruit and flowers at the farmer’s market. I was really afraid to ask the price- figuring it was WAY out of our league. I was shocked that it was exactly at the top end of our price range! I arranged to see the house the next day. I was so excited I could hardly sleep all night. Driving to the farm I was just giddy. By now I just knew in my heart that it was the one I’d be visualizing and dreaming about. As I pulled up to the driveway I just teared up- yes, indeed it was the place of my dreams. I texted Greg before I even set foot out of the car. “Yep. this is it, it’s the one.” As I toured the property I was only hearing about half of what LeeAnn said. My mind raced ahead, it was everything I imagined plus more! Before the tour was over I was already imagining where I would place furniture and how to arrange the sanctuary’s animal residents. Our offer has been accepted and we are coordinating our house sale with their purchasing of a new house. They aren’t selling to anyone else and we aren’t looking anywhere else. As soon as they find their new dream house we will get our house listed and hopefully be moving in late winter or early spring! It really is a dream come true! Meet Onyx, Our Pot Belly Pig!